This book explores the history of pre-communist Indochina, from the fourteenth century to the 1940s. It examines the early state of Vietnam, comparing and contrasting its political and social systems, with both those of neighbouring states such as Thailand and those prevalent at the time in Europe. 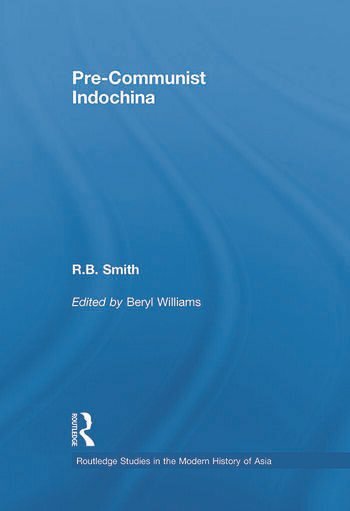 It identifies the forces that shaped Indochina before the arrival of European colonial powers, in particular the impact of China, which was not only a military threat and extracted payments of tribute, but was also an important commercial and cultural influence, not least through the export of Confucianism. It demonstrates clearly that the events and transformations of the late 16th and early 17th centuries are the starting point of developments which by around 1800 established the broad pattern of political and economic relations that existed before the nineteenth century 'impact of the West' began. It goes on to consider the impact of European colonialism in Indochina, focusing especially on French Indochina. It explores the ways in which the French occupiers groomed a new indigenous colonial elite to replace the existing elites who refused to co-operate with the authorities, and examines the growing opposition to French rule, including the role played by the often misunderstood religious and political movement of Caodaism. It analyses the different avenues of expression of Vietnamese nationalism, including the emergence of the Constitutionalist Party - the nearest French Indochina had to a democratic party in the Western sense. It shows how it sought to seek, through the actions of the French themselves, reforms that would lead to the modernisation of the country and more liberty for its inhabitants; and explains why it ultimately failed to achieve its objectives. Written by the late Ralph Smith, a highly respected historian of Asia, this book is essential reading for anyone seeking to understand the history of Indochina. R.B. Smith was Professor of the International History of South-East Asia at the School of Oriental and African Studies, University of London, where he taught from 1962-2000. His works include Vietnam and the West (1971); and the three volume An International History of the Vietnam War (1983, 1985, 1990). Beryl Williams is Emeritus Reader in History, University of Sussex, UK. She taught at Sussex from 1963-2003, and her publications include The Russian Revolution 1917-1921 (1987) and Lenin (2000).